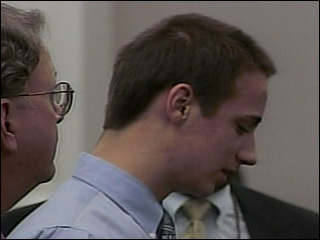 In this image from television, Pittman reacts as he is sentenced. A juror speaks about the verdict, as the killer's family laments his fate. A jury delivers its guilty verdict against Christopher Pittman. Do you think the 30-year prison sentence is appropriate for the teen found guilty of killing his grandparents? CHARLESTON, South Carolina (CNN) -- A judge sentenced a 15-year-old boy Tuesday to 30 years in prison for killing his grandparents after jurors rejected defense arguments that taking the antidepressant Zoloft drove the youth to kill. The jury convicted Chris Pittman earlier Tuesday on two counts of murder in the 2001 slayings of his paternal grandparents, Joe and Joy Pittman. In closing arguments Monday, prosecutor John Meadors belittled the defense's contention that Zoloft influenced Pittman, then 12, to carry out the shootings, calling such an argument a "smoke screen." "The only issue is -- did he know the difference between right and wrong?" Meadors said. "Shooting them in bed with a [.410-gauge shotgun]," he said, "that's malice, meanness, wickedness." In his closing argument, defense attorney Paul Waldner told jurors, "In this state, in this country, we do not convict children of murder when they've been ambushed by chemicals that have destroyed their ability to reason." The jury began deliberations Monday afternoon, meeting for four hours before adjourning for the day and returning Tuesday. Through an uncontested stipulation, Pittman's attorneys have acknowledged that the boy carried a shotgun into his grandparents' bedroom on November 28, 2001, shot them to death in their sleep and burned down their house outside Chester, South Carolina. "I think he did it because he was very mad, very angry," testified Dr. James Ballenger, a psychiatrist for the prosecution. Not so, said Dr. Lanette Atkins, a psychiatrist for the defense who testified the boy told her he heard voices, "echoes from inside his head, saying, 'Kill, kill, do it, do it.' "
Defense psychiatrist Dr. Richard Kapit testified that Pittman "did not have the ability to form criminal intent on that date due to intoxication with Zoloft." But prosecution psychiatrist Dr. Pamela Crawford said the boy did, as evidenced that he burned down the house to conceal the crime. "It shows not only that he knew it was wrong, that he knew it was legally wrong to do this," Crawford testified. Pittman was a troubled child from an unhappy home headed by a single father who was a stern disciplinarian. The boy ran away from home and then threatened suicide. He was sent to a psychiatric center in Florida for six days before his grandparents brought him to their home in rural upstate South Carolina. A doctor in Chester prescribed a starter dose of Zoloft as a substitute for another antidepressant Pittman had taken in the psychiatric center. Family members say the boy became fidgety, couldn't sit still and talked about his skin being on fire -- signs of compulsive restlessness that some doctors have warned is a possible side effect of the medication. When the boy got into a fight with a younger child on the school bus, his grandfather talked of sending him back to Florida. That night, the youth lay awake in his room, then got his shotgun, loaded it with birdshot and walked into his grandparents' bedroom while they were asleep. In his signed confession, Pittman said, "I went into the bedroom. I just aimed at the bed. I shot four times." The jury could have found him guilty but mentally ill, not guilty by reason of temporary insanity or not guilty for lack of criminal intent. Zoloft is one of the most popular antidepressants, part of a newer generation of such drugs pioneered by Prozac. Although not approved for treating children with depression, doctors widely prescribe it for younger patients. Zoloft's manufacturer, Pfizer Inc., has denied there is any scientific evidence that the drug leads to violence toward others. The Food and Drug Administration has retreated from an earlier warning that such antidepressants can cause suicidal actions among children and teenagers. Limiting the warning language to a risk seen in studies, rather than saying the drugs could cause suicidal behavior in younger patients, was a significant retreat for the FDA -- and came after months of pharmaceutical industry lobbying.